Spring is almost here and where are you as a Realtor in building high quality buyer and seller leads? If like most of your fellow pros, you’re hurting in seller leads. They’re tough to get. You’re likely paying $30 to $50 per click to get in front of buyers on Google or Facebook. Some buyers are sellers. Many have a home that will have to be sold, yet Realtors want a more direct path to sellers. It’s all about building solid commissions. What sellers want from Realtors is the ability to attract a lot of good buyers and assure a great bid. In the luxury market, there’s plenty of inventory, so a Realtor that can present their property well, and create a solid value proposition that gets buyers focused is going to be chosen. Sellers are different from buyers in the way they use digital media and search. They’re less active and more focused on value. They’re pretty certain they’ll get a good price based on the supply shortages today. It’s an awkward situation for most luxury home seller Realtors who are used to big demand. The tide in housing markets has changed, and as a single agent, with a brand that isn’t as convincing as it used to be, you need a better strategy. 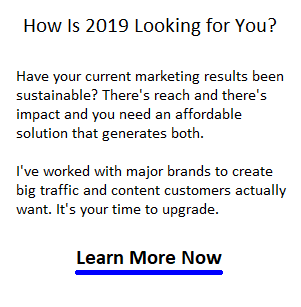 Below, you’ll find a list of marketing services that promise to connect you with buyers. It’s a short term ploy, and these companies know many Realtors are desperate and unorganized. They know you won’t build a long term career strategy to position you as the top Realtor in your market. The market is more competitive, and you need to look at the big picture and build a digital marketing strategy with a real foundation. Exposure, brand image, connections via Google and Facebook, leads and credibility. Companies which specialize in attracting real estate leads are known as lead generation companies. They advertise houses for sale and other remarketing advertising on Facebook and Google Adwords along with blogs and news sites to cull leads. They promise to rid you of the advertising and prospecting work and accelerate the lead generation process. Unfortunately, when scraping for leads this way, a lot of poor quality leads are served up to participating Realtors. And the terms of the arrangement may not be attractive. If it worked, who wouldn’t sign up? Well, nothing’s ever that easy. So let’s take a closer look. Realtors from Boston, Miami, Los Angeles, Houston, San Diego, Seattle, New York, Denver, Atlanta, Chicago, Vancouver and Toronto are wanting something better. Is it too good to be true? Buyer sand Sellers. Find Good Real Estate Leads Fast! There’s nothing wrong with fast, if it’s real. It can happen, and you shouldn’t be afraid to spend. Here’s 20 top lead generation services with a look at their strengths and limitations. 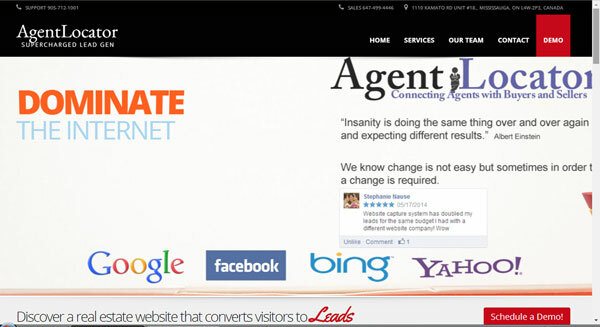 This post is an exploration of 18 of the best online real estate lead generation companies in the US and Canada. And 2 more including Zillow Leads. There’s more new lead generation companies arriving every week. Acquiring leads this way won’t hurt, however converting leads has a lot to do with brand image. Even if they agree to work with you right away on the phone call, they will Google you online and visit your website. Who wouldn’t? Trust, transparency, responsiveness, and proven competence are what motivate them. There’s no doubt you can sign a client right away, however you probably need to take a hard look at your online presence and ask yourself whether you like what you see. Would you hire you? 90% of home buyers go online, and you need to be in front of them and number one in your Zip Code. Home sellers are there too checking out comps and searching using keyword phrases such as home selling tips, best return on home renovations to homes for sale + cityname, to bidding wars and best real estate agents. They’re doing hundreds of millions of searches using Google, Zillow, Realtor.org, Yahoo, and thousands of other websites. Make sure you’re highly visible on Google for all of them. Set up an amazing new mobile friendly IDX website, with outstanding, professionally optimized content, use some real estate videos, and do a little pay per click advertising. Build a strategic plan, then work the plan. With spring markets so inviting in Los Angeles, San Diego, Toronto, Boston, Houston, New York, San Francisco, Seattle Phoenix, Charlotte, and Miami, you’ll want to maximize your presence now. Please do Share this post with other agents you know. Who are Lead Generation Companies? These are firms who provide buyer (or sometimes seller) leads for realtors, using methods of aggregating online prospects (most often via Google Adwords or cheap ad networks) which they then sell to realtors. 3 drivers promote the growth: a lot of prospects are online, home buying is in a frenzied state right now, and the fact there is only one home sold for each realtor in North America — there are too many realtors and most have few quality leads. Questions: Let’s assume they can generate solid leads. do you have the patience and skill to nurture and close these types of leads? do you have a website that can help convert them? what is the real cost of doing business with them? would a luxury home owner from your target community use their websites? can you respond to these cold leads fast? The way these lead generators collect leads may be why they could be of poor quality. Ad campaigns, auto-dialers, and sketchy email lists of people make for testy, suspicious prospects. And these are someone else’s leads — they initiated them, which takes the warm and fuzzy out of it. Anything transferred from one person/company to another loses something in the process – the problem is lead quality and lead conversion. Some realtors say these leads are hard to close while others treat them like flies at a picnic. They’re basically cold calls and the prospect knows nothing about realtor’s brand image or honesty. And how do real agents and brokers feel about lead generators? Here’s 18 of the most visible lead generation companies onlinealthough new ones are coming. I’m leaving out realtor.com, and Zillow Leads because they’re more like Google or Facebook advertising programs. Some are well known while others are regional or startups. They all seem to be missing the vital component that creates genuinely good deals (in your target Zip Code) – the ideal customer experience from beginning to end. With some of them, the fees are low, sometimes only $20 a month and other times a little high, but almost never outrageous. For most, it’s like playing the penny slot machines at the casino. There’s a chance you could win, but is the payout worth it? A few of the companies you’ll see below actually have you set up an account to be available for leads. Sort of like realtors sitting around a poker table. If you don’t respond fast, the lead is sent to someone else. In other cases, you will have to “buy your territory.” The lead gen firms will push you in that direction once they have you on the hook. Before you hire a lead generation company, consider how home buyers and home sellers themselves buy and sell a condo, home or property. They likely already know a local realtor or they’ll go to Google to search. So online is a great place to be to lure the prospect away from his/her familiar agent. Real Estate Search: Prospects begin with Google even though they could go directly to realtor.com or realtor.ca for MLS listings in their Zip code, or a major brokerage website such as remax.com, sothebys.com or kellerwilliams.com. Google has a better brand, a better search experience, and it leads to realtor’s websites or phone numbers where they can begin a trusting relationship with that agent. Few condo or home sellers would type their personal details into the text box of an unknown website. And buyers are normally pretty cautious too. They want to get to know the realtor, so they’ll Google his or her name and if that discovery experience is unsatisfying, it dampens their spirit. That’s why it’s a good idea to be online in a good way – i.e., a great realtor brand image — an image built on prospects needs and preferences. Google Adwords and remarketing programs could capture some good leads online. The highest quality leads will often originate from Google. However, most realtors could do this advertising themselves assuming they have a website with lead converting webpages. These programs are just a normal part of what a real estate digital marketer would offer along with lasting, sustainable, marketing assets. Would I recommend using the lead generation companies? If they’re very cheap you probably don’t have much to lose other than your time, yet you could get distracted and fail to put 100% into your career. If you’re bright, you may learn a little about how they generate and convert leads. 1. Bold Leads – Bold leads advertises on unspecified networks to capture leads and direct them to you. If the lead doesn’t give away info, boldleads will continue to nuture the lead for you. You are given your own landing page on the boldleads site. 2. Agent Locator – tells you straight they’ll conduct your ppc advertising and generate 480 leads for $6000. I like how they’re open about it. It may be worth gambling $6000 to try it out. 3. Market Leader – Aggregates leads from their own site called homevalues.com, Trulia.com, and via ppc advertising. Market Leader guarantees they won’t sell the lead to another agent. You get to manage it all from your “Pro” account. 4. Point2Homes Leads – offers low priced straight forward advertising options on its website where prospects arrive to search for a home. They also provide you with a webpage on their site. 5. Real Estate Pipeline Leads – Real Estate Pipeline Leads says it has a network of real estate sites where it draws leads, and it gives realtors full ownership of their territory, although the size of that territory isn’t explained. Drip email campaigns are a big part of their service. Their basic package is $1164 for 12 leads. 6. Agent Pronto Leads – Agent Pronto is different. There’s no upfront charge for leads! You will only be matched to referrals who have specifically requested to speak with an agent. 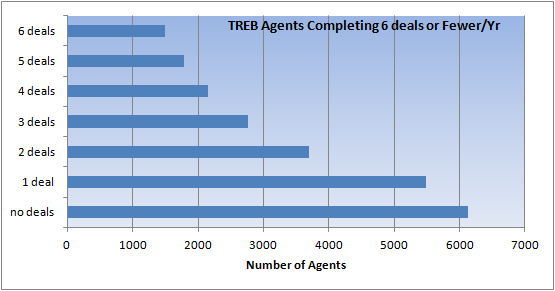 They match each referral with a single agent that they believe is the best fit for their needs. Once you accept the referral, they provide your with the prospect’s full information and the details from their conversation with them. Sounds good. Their site looks a little lacklustre, but give them a good look. 8. Offrs – Offrs uses vague sounding smart technology to find homeowners who are going to put their house on the market. It’s based on predictive algorithms or just social listening perhaps. If it works, it would be very exciting technology. Combine that with communications that encourage homeowners to actually sell the property and that could be very powerful, particularly right now in places such as San Francisco, Los Angeles, Miami, Toronto and Vancouver where prices are very high. They list by territory, but sadly your territory or Zip Code may be taken. 9. 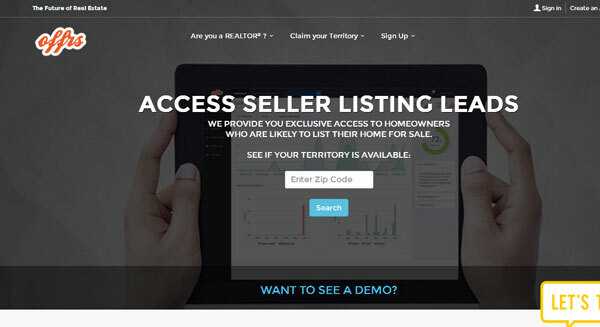 Trulia – Offers a service for seller leads with Market Leader, a company that was in severe trouble before the purchase. Trulia is no Zillow, but it does have some traffic. 10. Prime Seller Leads – Prime Seller leads creates a bunch of pages on their site for you. The CMS offers the ability to send epostcards and eflyers and their system integrates with many broker CMS. 11. eRealting – eRealting doesn’t sell leads, they give you a website to send all your traffic to! It’s kind of a CMS for rent. They state that it costs about $300 to create a client in their solution. 12. 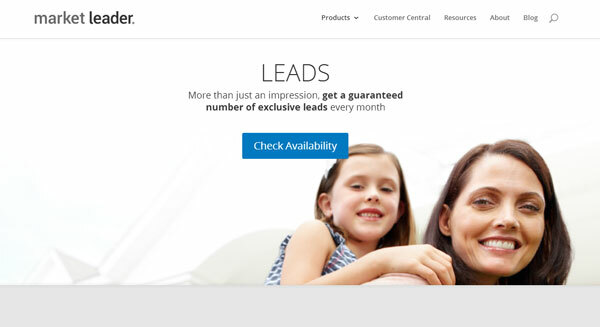 Lead Galaxy – Lead Gives you a home for your leads and uses the usual combo of Adwords, Facebook ads and telephone prospecting to create leads. 13. Experian – Experian is a research and statistics business who have mailing lists of potential buyers and sellers. You can build your list online. 14. Exact Data – Exact Data gets its lead list from telemarketing, opt in emails, and lists of prospective buyers and sellers. They claim superior data hygiene, however most list companies promise that. 15. Commissions Inc. Lead Platform – Commissionsinc claims they are the #1 Real Estate Tech Solution. They offer a platform and an app to manage your leads. They will run your Adwords and Facebook advertising campaigns for you. Sounds like a lot of noise. The value proposition is a little flaky. 16. Firepoint Realty Leads – Firepoint says they deliver scalable lead generation with intelligent routing, to automated lead follow-up and task scheduling, to ROI and conversion reporting for all of your lead sources. The price is $350/month and you set you PPC budget which they manage. Is this better than a self-directed digital marketing program? 17. 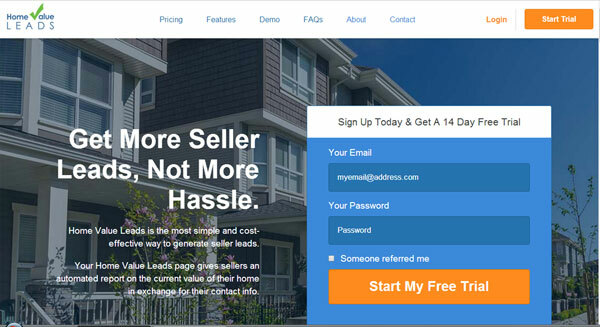 Home Value Leads – Home Value Leads offers a CMS system for $59/month. 18. Refindly Seller Leads – REfindly helps you generate, engage, and convert leads using one convenient system. They claim that historically, their agents receive between 5 and 8 leads per $100 spent in advertising. You can spend as much as you like on ppc advertising and they give you a lead management system to use. At the end of the day, it all comes down to leads and sales, dollars and time. I must say, I like Agent Pronto, and Offrs best. Even the best lead generation sources and sites can be a negative if you neglect to build your own Internet presence and realtor brand image. People want to do business with those they know and trust. Should getting known and trusted be your Job #1 in 2019? Real Estate Lead Generation Company in Los Angeles, Phoenix, Denver, Seattle, Chicago, Boston, New York, Dallas, Houston, San Antonio, Austin, St Louis, Minneapolis, Green Bay, Charlotte, Tampa, Miami, Orlando, Toronto, Vancouver, Montreal, Ottawa, Oshawa, Hamilton, Newmarket, Richmond Hill, Oakville, Calgary, Kelowna, Mississauga, Anaheim, Beverly Hills, Malibu, San Diego, San Francisco, San Jose, Fresno, Santa Clara, Sacramento, Mountainview, Palo Alto, Portland, Washington, Atlanta, Irvine, Nashville, Sunnyvale, Salt Lake City, Riverside, Rancho Cucamonga, Costa Mesa, Thousand Oaks, Simi Valley, Raleigh, Albuquerque, Glendale, Oceanside, Long Beach, Huntington Beach, Carlsbad, Santa Clarita, Henderson, Mesa, Temecula, Kirkland, Redmond, Kansas City, St Louis, Stockton, Scottsdale, Palm Springs, Indianapolis, Columbus, Colorado Springs, Fort Worth, Chula Vista, Escondido, Santa Monica, Miami Beach, and Honolulu. Find a Los Angeles Real Estate Agent who has the very best real estate marketing wizard to help you sell your home for more. We just closed on our 12th listing with bold leads which is a great roi for us in our market in NY. Thanks for this overview – it’s very helpful! We’re always looking to add lead sources and stay competitive in this crazy market! Hi Janet! That’s great to hear. I’m going to do a post on Bold Leads, so I hope you would be kind enough to share your views on them. According to my webstats, Bold Leads is the service realtors are most interested in. They do heavy ad campaigns on Google and of course, there’s some good leads available via Google. Money makes it happen! Thank you, for those useful tools. I have never heard before about some of them. I’ll definitely try these services as soon as I need them. https://rentberry.com/ is one more property listing website that can generate additional leads to real estate business. It’s similar to Trulia in a sort way. However, the platform was created only for rental properties. Nancy, thank you. The rental market in many cities (i.e. San Francisco) is a huge market and a great resource for realtors and real estate marketers. I like Rent Berry, very efficient for landlords and helpful for all those stressed out renters. Finding a rental fast now is almost a life or death matter for many in the big cities. Good luck! I love your honesty in this piece. I myself own a lead generation company and we have seen great success. None the less I enjoyed reading your post. Thanks So much Don. Coming from a successful real estate marketer, I appreciate that. Yes, as you said, some lead generation companies do have success. A few offer some interesting, out of the ordinary services too. Hope you have continued success at therealestateseo.com. Great info here, I just need to decide what route is best for me. I do have experience in marketing, but am in my first year of real estate. I’m already having success, but I want to move faster and dominate. Do you recommend bold leads first or another option (I’m in the competitive Arizona market). There are so many to choose from and I want to start off right. Hey Chris, Thanks so much. I see Gilbert Realty is with Firepoint so I take it you’re not enamored with their product? That’s great that you’re starting out ambitious. You really do need that energy and spirit to thrive, especially in the Phoenix market which must be crazy with leads. In this climate, it should be easy for Bold Leads and the others to get your leads. If you’re doing okay, sink as much as you can into your own website and lead generation. I see Curtis Johnston is doing some blogging but without optimization, and with standard topics everyone has already read, it’s not going to fly. His site has a lot of 404 errors too with his listings. Bold leads is simple enough and without your own website it might be best. If you direct everything to GilbetRealtyAZ, you could find a lot of your leads leaking to Curtis. You can see how that would eat into your sustained results. You’re a marketing guy, so you absolutely do your own ppc. That’s how Bold Leads and the others get them — PPC. One thing for sure is you’ll get out of it what you put in. Take a good look at the depth of my Realtor Service details packages and you’ll get an idea of how to dominate Phoenix. Build a great personal Realtor brand and get big exposure. Good luck Chris. Pretty exciting career to choose!